Size: Inlet 3/4 " x Outlet 3/4 "or Inlet 1/2" x Outlet 1/2"
Thread Size: 1/2" to 3"
Size of Underlay: 11 " X 20"
Tubing Connection: 3/8" & 1/2"
Offered in a variety of materials such as SS316/L, SS304/L, CS, Monel. NACE certification offered. Parkers air header distribution manifolds are designed to distribute air from the compressor to the actuators on pneumatic instruments such as steam flow meters, pressure controllers and valve positioners. 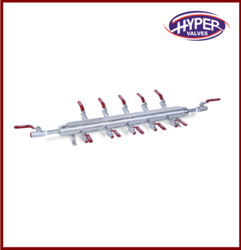 These manifolds are widely used in industrial chemical processing, plastic processing and energy industries. 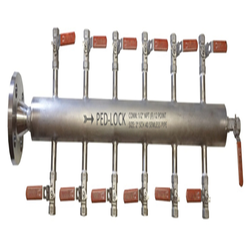 We are renowned organization of Pressure Manifold. Our products are widely employed in the market owing to their longer working life. WINFLOW range of compact, economical air distribution manifold can be supplied in standard configuration as shown above or as per clients requirement. WINFLOW distribution manifold can be supplied with maximum 20 nos. of ball, needle valve with different inlet and drain connections as per client's specifications. Membrane Plates usually operate at a feed pressure of up to 7 bar and squeeze pressure up to 15 bar. Special plates can be designed for higher feed & squeeze pressure. By understanding the needs of patrons, we are presenting a quality approved spectrum of Brass Air Manifold in the market. The offered products are designed from high-quality brass.